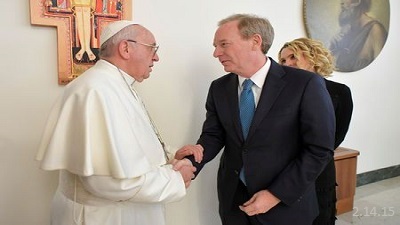 Microsoft’s Chief Legal Officer and President Brad Smith met with the Catholic Pontiff today to discuss how AI can be used ethically and what can be done to help bridge the digital divide between rich and poor nations. The talks at the Pope’s residence lasted 30 minutes and concluded with an announcement that its Academy for Life would jointly sponsor a prize with Microsoft for the best doctoral dissertation in 2019 on the theme of “artificial intelligence at the service of human life”. Smith separately told the Vatican newspaper L’Osservatore Romano that “strong ethical and new, evolved laws” were needed so that technological advances such as artificial intelligence do not fall into the wrong hands. Smith had been advocating for some time for new legislation to govern artificial intelligence software for recognizing faces, as a way to mitigate the risks of biased outcomes, intrusions into privacy and democratic freedoms. Microsoft’s preoccupation with the nascent field of AI safety, on the other hand, appears somewhat at odds with its enthusiasm to give its best tools, including AI, to the US Military, even if it is with the explicit purpose of “increasing lethality”. Smith told Bloomberg Microsoft only wants to prevent law enforcement from using the technology for ongoing surveillance of a specific individual without the preferred safeguards.